Beaudesert, a small town 64 kilometres south of Brisbane, was settled in the mid nineteenth century. The area was somewhat isolated until the construction of a railway linking Beaudesert to Brisbane in 1886. The Beaudesert Museum (54 Brisbane Street) showcases the town's history and the creativity and resourcefulness of its pioneers. And the third section is currently home to historical industrial equipment like a metal press guillotine and Gutenberg machinery. 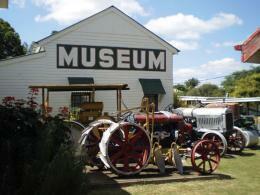 The Beaudesert Museum is open daily from 9.00am until 4.00pm, excluding Good Friday and Christmas Day. Admission is $7.50 for adults, $6.00 for concession holders and $2.00 for children. The museum is run by the Historical Society of Beaudesert, a non-profit organisation that endeavours to preserve and promote the history of the Moreton Bay settlement through to present day. The society also houses historical records and archives related to the history of the region. If you have a research enquiry, you can ask for their assistance via the website.